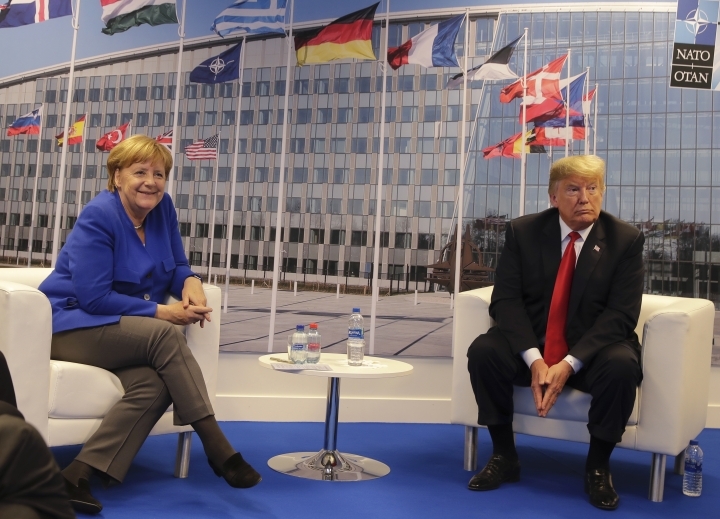 President Donald Trump has jolted the NATO summit in Brussels by turning a spotlight on Germany's ties to Russia and openly questioning the value of the military alliance that has defined American foreign policy for decades. Trump declared that a joint natural gas pipeline venture with Moscow has left German Chancellor Angela Merkel's government "totally controlled" by and "captive to Russia." Trump tweeted after a day of contentious meetings, "What good is NATO if Germany is paying Russia billions of dollars for gas and energy?" 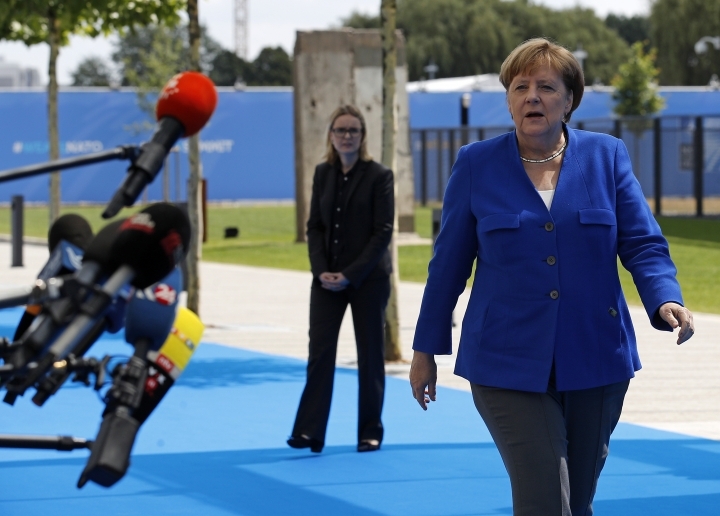 Merkel hit back immediately, not only denying Trump's contention but suggesting that his comfortable upbringing in the U.S. gave him no standing to spout off on the world stage about Germany. Poland's President Andrzej Duda and President Donald Trump have spoken on the sidelines of a NATO summit in Brussels about strengthening military cooperation. The talk Wednesday comes as Poland is lobbying to have thousands of American troops permanently stationed in Poland as a deterrent against a resurgent Russia. According to news reports in Poland, the Warsaw government has offered up to $2 billion to help build the infrastructure for the permanent deployment. The head of Duda's office, Krzysztof Szczerski (KSHISH-tof SHARE-ski), told the state Polish news agency PAP that the leaders spoke "mainly about military cooperation, including the strengthening of Polish-American military cooperation in the field of equipment and cooperation of military units." The meeting marks a significant improvement of ties between the two countries after Poland recently softened a controversial Holocaust speech law that the U.S. had strongly opposed. Poland scrapped the threat of prison terms for claiming Poland is co-responsible for the Holocaust, but civil penalties can still apply. President Donald Trump and first lady Melania Trump are attending a dinner for NATO leaders in Brussels. The gathering comes just minutes after Trump tweeted "what good is NATO" amid a day of grievances about the decades-old alliance. The Trumps arrived at the Art and History Museum at the Cinquantenaire and first mingled with other leaders at a cocktail reception. Neither Trump took a drink as they chatted with other heads of state. The president does not drink alcohol. The Trumps were seen mingling with German Chancellor Angela Merkel hours after the president had criticized Germany for making a gas pipeline deal with Russia. They also spoke with President Recep Tayyip Erdogan (REH'-jehp TY'-ihp UR'-doh-wahn) of Turkey. The leaders then posed for several group photos and took in an acrobatic performance before entering the dinner reception. NATO Secretary-General Jens Stoltenberg is sidestepping questions about whether President Donald Trump has asked his allies to double their defense spending ambitions. 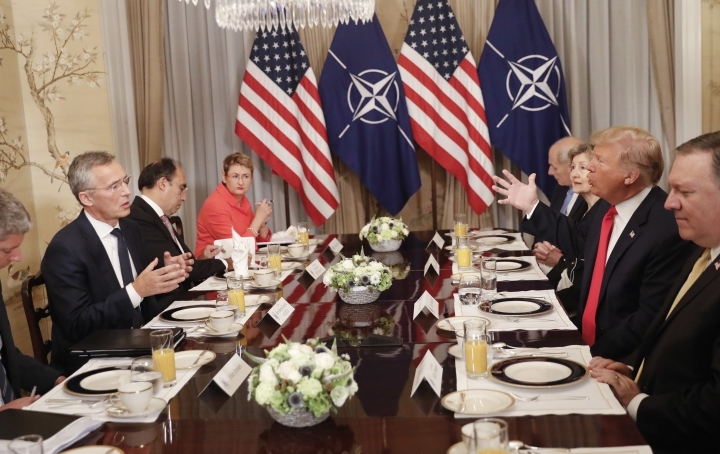 At a NATO summit in Brussels Wednesday, Trump suggested that U.S. allies should commit to spending 4 percent of their GDP on defense, up from the current goal of moving toward 2 percent by 2024. Asked about Trump's suggestion, Stoltenberg said he'll focus on what's been agreed to. Says Stoltenberg: "We have agreed that we're committed to the pledge increasing defense spending to 2 percent. So let's start with that." Around eight members of the 29-country military alliance are expected to reach the 2 percent target this year. Trump's biggest target for criticism, Germany, predicts that it will be spending 1.5 percent of GDP on its military budget by 2024. President Donald Trump is escalating his criticism of NATO while he is in Brussels for a summit with alliance leaders. In a Wednesday tweet after a day of meetings, in which he lashed out at allies for insufficient defense spending, Trump calls on member nations to immediately boost spending. Trump tweets: "Why are their (sic) only 5 out of 29 countries that have met their commitment? The U.S. is paying for Europe's protection, then loses billions on Trade. Must pay 2% of GDP IMMEDIATELY, not by 2025." Contrary to Trump's assertion, NATO nations committed in 2014 to spending at least 2 percent of GDP on defense, but only by 2024. The second most-powerful Republican in the U.S. Senate says he is sympathetic to President Donald Trump's assertion that Germany is "captive to Russia" because of its dependence on Russian natural gas and other energy sources. Texas Sen. John Cornyn says he also wishes Germany "would step up and meet their responsibilities under NATO." Cornyn says it's pretty clear Germany has decided its relationship with Russia is important to them because Russia is their source of energy. Cornyn said Trump was right to ask whether Germany is "perhaps pulling their punches" with regard to its support for NATO because of its dependency on Russia. Cornyn says he understood what Trump was getting at with his use of the word "captive" but would not have used that specific word himself. U.S. House Speaker Paul Ryan is defending NATO as "indispensable" after President Trump roiled a gathering of the alliance by sharply criticizing Germany. The Wisconsin Republican says Trump is right to push NATO members to meet their defense spending obligations. But Ryan adds that the military alliance is "as important today as it ever has been." Trump lashed out at German Chancellor Angela Merkel at a summit in Brussels. He claimed that Germany is "totally controlled" by and "captive to Russia" because of an oil and gas pipeline. Asked if he agreed with Trump, Ryan said he's mentioned "those same concerns" to European leaders about the pipeline, which carries natural gas from Russia to Europe. Republican U.S. Sen. Thom Tillis is heading to Brussels later Wednesday as part of the recently relaunched Senate NATO Observer Group. The group was re-established earlier this year with Democratic Sen. Jeanne Shaheen of New Hampshire in a show of bipartisan support for the alliance. Tillis says "we have to let them know that Congress is supportive of NATO." The North Carolina lawmaker adds that he supports President Donald Trump's goal of trying to get investment levels up, but says the "broader relationship" could benefit from some re-examination. He says he sees where Trump is trying to go, but suggests he maybe would use "different tactics." And on Trump's comments about Germany, Tillis says he "wouldn't have said that." 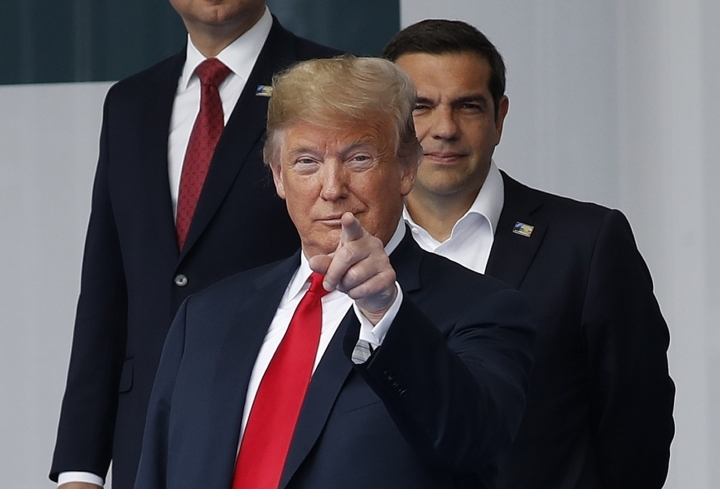 President Donald Trump has suggested that NATO allies commit to spending 4 percent of their GDP on defense, up from the current goal of 2 percent by 2024. White House press secretary Sarah Huckabee Sanders confirms Trump raised the idea at a closed-door meeting with fellow NATO leaders Wednesday in Brussels. It's unclear by what date he'd like to see the increase. 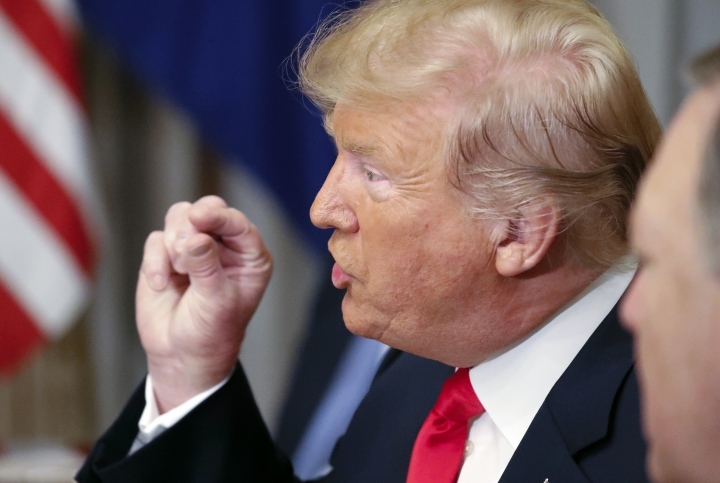 Trump has been pressing member countries to spend more on defense, accusing them of freeloading off the U.S.
House Speaker Paul Ryan is defending NATO as "indispensable" after President Donald Trump roiled a gathering of the alliance by sharply criticizing Germany. The Wisconsin Republican says Trump is right to push NATO members to meet their obligations. But he adds that the military alliance is "as important today as it ever has been." Trump lashed out at German Chancellor Angela Merkel at a summit in Brussels. He claims that Germany is "totally controlled" by and "captive to Russia" because of an oil and gas pipeline. The longest serving Republican U.S. senator says: "I don't agree with that. Germans wouldn't agree with that. They are a very strong people." Hatch met with German Chancellor Angela Merkel when he traveled to Berlin last week. In Washington on Wednesday, he says: "I have the highest opinion of her. I think she's one of the great leaders of this world." 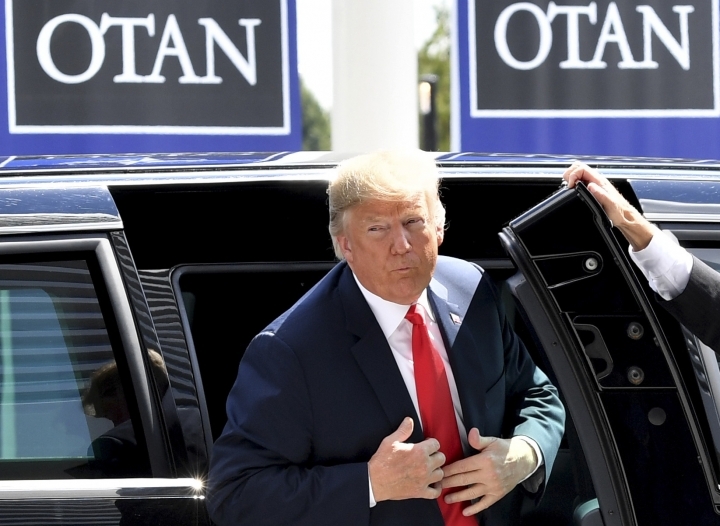 Trump was openly critical of Germany as a NATO summit opened in Brussels, objecting to a pipeline that would bring Russian natural gas directly to Germany and calling on the NATO ally to increase its spending on defense. 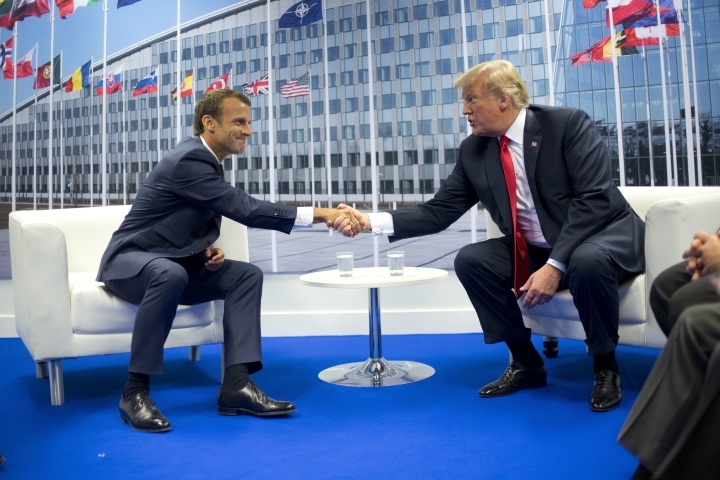 French President Emmanuel Macron says he disagrees with President Donald Trump's assessment that Germany is "totally controlled" by Russia because of an oil pipeline. Macron was asked about Trump's assertion Wednesday as the leaders sat down for talks while both are attending a NATO summit in Brussels. 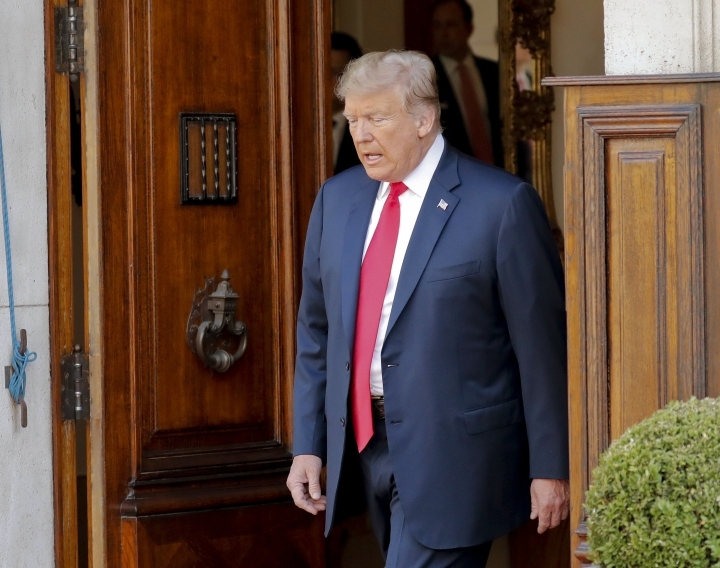 Trump has been hammering France and other European countries over their defense spending, as well as over trade deals he says are unfair to the U.S. But Trump told reporters in the room for part of the meeting that he and Macron have a "tremendous relationship" and that it was an "honor to be with a friend of mine." He added that "hopefully in the end it will all work out." Macron also recalled Trump's trip to Paris last year for a Bastille Day celebration and said they'll continue to work together. President Donald Trump and German Chancellor Angela Merkel have met after the U.S. leader publicly lambasted the longtime ally over its spending on national defense and a Russian oil pipeline. Sitting down in Brussels, where both are attending a NATO summit, Trump described it as a "great meeting." He says they discussed defense investment and trade, adding: "We have a tremendous relationship with Germany." Merkel said she raised issues of migration and economic development with Trump. Trump asserted earlier Wednesday that Germany is "totally controlled" by and "captive to Russia" because of a pipeline project. Trump told reporters that the pair discussed the pipeline during their meeting. He did not elaborate. 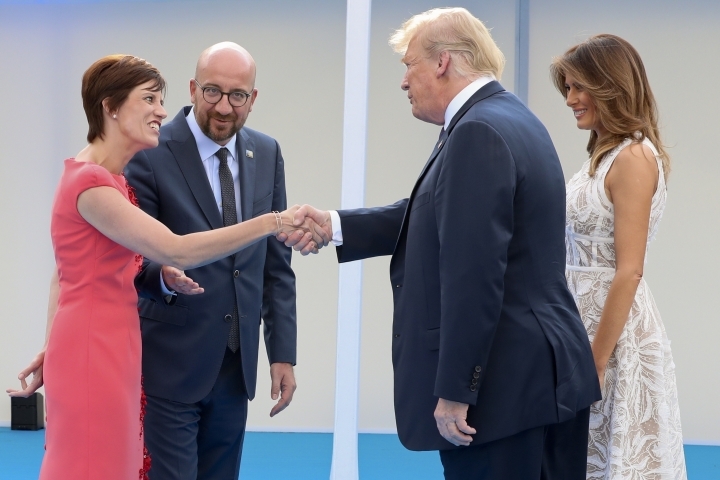 U.S. first lady Melania Trump is visiting a music academy near the Belgian capital as her spouse and other world leaders attend a NATO summit. 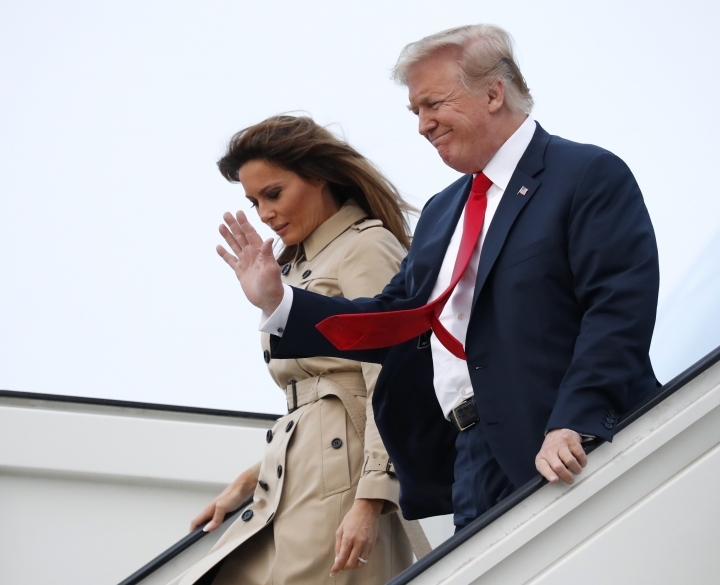 Trump, who is accompanying President Donald Trump on a weeklong trip to Europe, stopped Wednesday at the Queen Elisabeth Music Chapel in Waterloo, near Brussels. The 48-year-old Trump wore a navy blue Calvin Klein calf-length dress with white and green detail on the lapel and white Louboutin heels with their trademark red soles. Other participating first ladies include Brigitte Macron of France and Emine Erdogan of Turkey. President Donald Trump says he's thinking about American farmers even as he meets with NATO allies in Brussels. Trump says in a two-part tweet Wednesday that he's "in Brussels, but always thinking about our farmers." Critics have warned that Trump's antagonistic trade moves will harm American farmers who grow crops like soybeans. But Trump says "Farmers have done poorly for 15 years" and blames "Other countries' trade barriers and tariffs" for "destroying their businesses." He's pledging to open "things up, better than ever before" but says "it can't go too quickly." Trump says "I am fighting for a level playing field for our farmers, and will win!" The tweet came as Trump attended a closed-door meeting of the North Atlantic Council. Staffers often send tweets for the president. 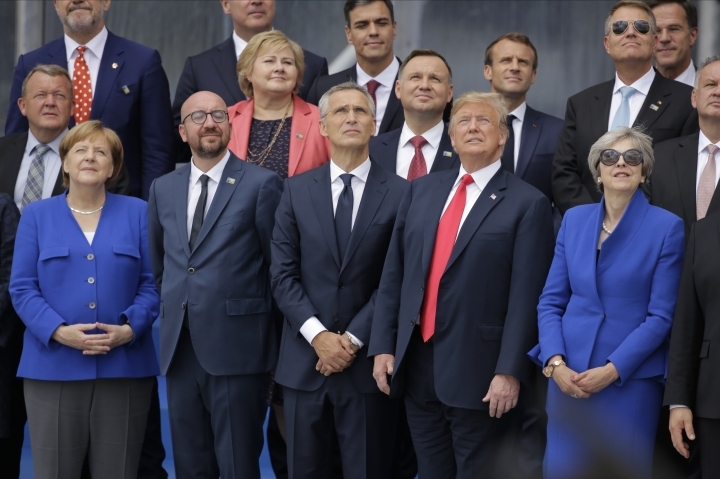 President Donald Trump is participating in a welcome ceremony with fellow NATO leaders at what's expected to be a fraught meeting of the military alliance. Trump was spotted chatting with British Prime Minister Theresa May and Turkish President Recep Tayyip Erdogan (REH'-jehp TY'-ihp UR'-doh-wahn) during public portions of the opening. But he appeared to steer clear of German Chancellor Angela Merkel hours after claiming her country was controlled by Russia. He also walked far behind the leaders of the U.K. and Canada during a walking tour of NATO headquarters. NATO Secretary General Jens Stoltenberg (yehnz STOHL'-tehn-burg) is stressing the need for the allies to stick together, saying, "We owe our success to our unity." President Donald Trump is set to meet Wednesday with German Chancellor Angela Merkel, hours after he publicly claimed that the longtime U.S. ally is "totally controlled" by and "captive to Russia." White House press secretary Sarah Sanders says Trump will reiterate his public criticism of Merkel during their pull-aside on the margins of the NATO summit in Brussels. Trump fumed during a Wednesday meeting with NATO Secretary-General Jens Stoltenberg that a Russian natural gas pipeline project in Germany is "very inappropriate" as he criticized European countries' contributions to the mutual-defense alliance. Sanders says Trump will also meet Wednesday with French President Emmanuel Macron. Buckingham Palace says Queen Elizabeth II will welcome President Donald Trump and his wife Melania at Windsor Castle where they will watch a military march before having tea on Friday. The palace said Wednesday the president will be greeted by an honor guard formed of the Coldstream Guards and will receive a royal salute before the U.S. national anthem is played. Trump and the queen will review the honor guard before watching a military parade. Trump and his wife will then have tea with the queen inside the castle. The palace did not specify if the queen's husband Prince Philip would attend. The 97-year-old Philip has retired from public duties but sometimes appears in public with the queen. The visit is part of Trump's first trip to Britain since becoming president. 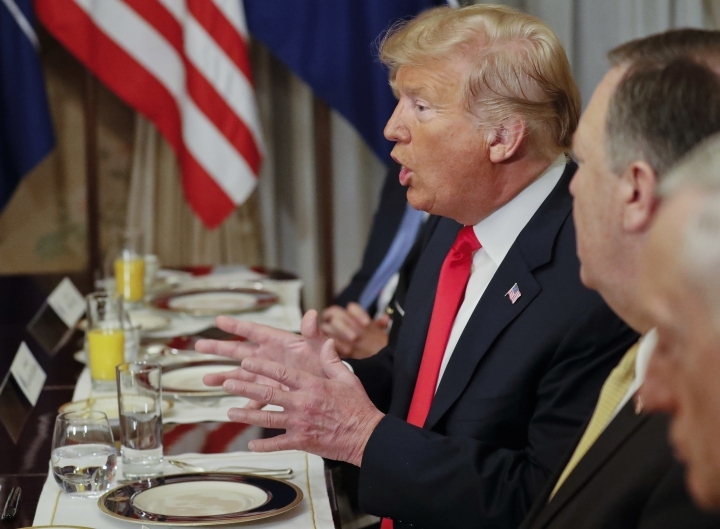 President Donald Trump is asserting that Germany is "totally controlled" by and "captive to Russia" over a pipeline project during a testy breakfast with NATO Secretary-General Jens Stoltenberg (yehnz STOHL'-tehn-burg). Trump is taking issue with the U.S. protecting Germany when the European nation is making energy deals with Russia. The president appeared to be referring to the Nord Stream 2 pipeline that would double the amount of gas Russia can send directly to Germany, skirting transit countries such as Ukraine. The project is opposed by the U.S. and some other EU members. Trump says of Germany: "We're supposed to protect you against Russia" and yet you make this deal with Russia. President Donald Trump is pressing NATO allies to bolster their defense spending as he opens talks with leaders of the military alliance. Trump says the disproportionate defense spending an "unfair burden on the United States." Trump says at the start of his meeting with NATO Secretary-General Jens Stoltenberg that "because of me" NATO has raised more than $40 billion in defense spending. Trump says, "So I think the secretary general likes Trump. He may be the only one but that's OK with me." The U.S. president has called upon NATO allies to meet commitments to spend 2 percent of their GDP on defense. 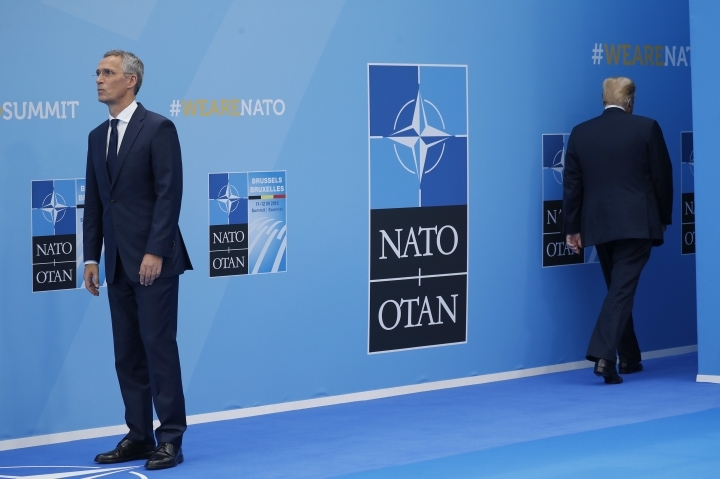 Stoltenberg says "a strong NATO is good for Europe." 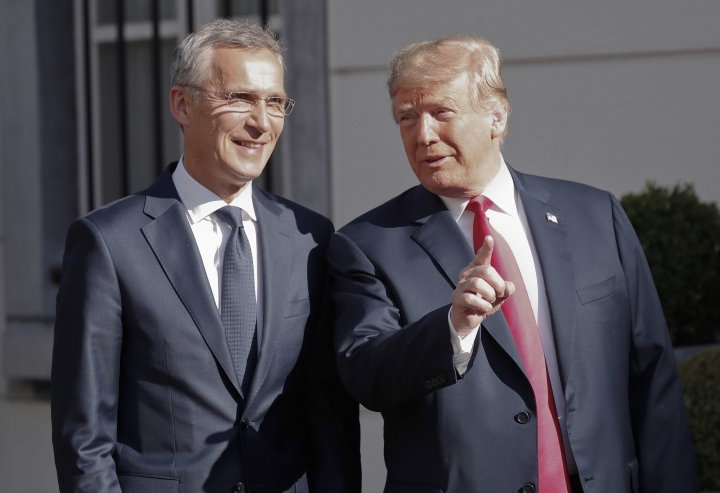 President Donald Trump is meeting with NATO Secretary-General Jens Stoltenberg (yehnz STOHL'-tehn-burg) at the start of a summit of the military alliance. Trump is expected to continue questioning wary NATO allies about their military spending during talks in Brussels. He tweeted en route from Washington that European counties "want us to happily defend them through NATO, and nicely pay for it. Just doesn't work!" Trump's day will include a welcome ceremony, a meeting of the North Atlantic Council and a working dinner with some of the same leaders he berated over trade during his last world leaders' summit in Canada last month. Brussels is the first stop of a weeklong European tour that will include stops in the United Kingdom and a meeting in Helsinki with Russia's Vladimir Putin.